Many advisors are constantly challenged with how to show their worth, define their value, and somehow put a finger on all the things they do for clients every day. Is this true for you? Although notions of your worth may be somewhat subjective, the value you provide isn’t entirely in the eye of the beholder. 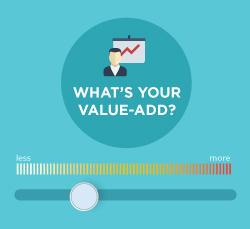 In fact, the following best practices can help you quantify your value-add and help better define the services that you provide to your clients to help them pursue their financial goals, as well as set yourself apart from the competition. 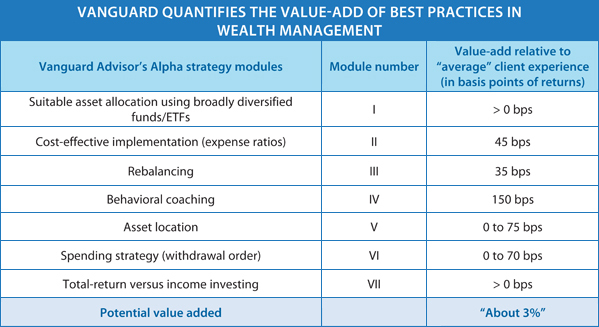 The Vanguard Advisor’s Alpha concept, created in 2001, illustrates how advisors can add value, or alpha, to client relationships using wealth management best practices—including financial planning, discipline, and guidance—instead of trying to outperform the market. Because this value often depends on a particular client’s perception of it, in its March 2014 white paper, Vanguard conducted a more in-depth analysis of the Advisor’s Alpha structure, attempting to explicitly quantify the benefit advisors following this strategy can provide to their clients, versus those who don’t. Vanguard ultimately found that its framework can add “about 3 percent in net returns” for clients while also functioning as a differentiator for your practice. How does it work? The Vanguard Advisor’s Alpha framework includes seven modules—spanning investment-related techniques to more relationship-oriented tactics. Although some may seem like commonsense choices, a dedicated commitment to pursuing these seven strategies in combination can help you keep your clients on track through both good and bad markets and strengthen your relationships with them. Across our industry, I continue to see wide acceptance of this last and basic tenet of investing and modern portfolio theory. Even my less financially savvy friends come to me for guidance on the proper asset allocation for them, which shows that this principle is fundamental for investors everywhere. Although this module argues for the ETF over the mutual fund, the reason isn’t solely limited to their expense ratios. 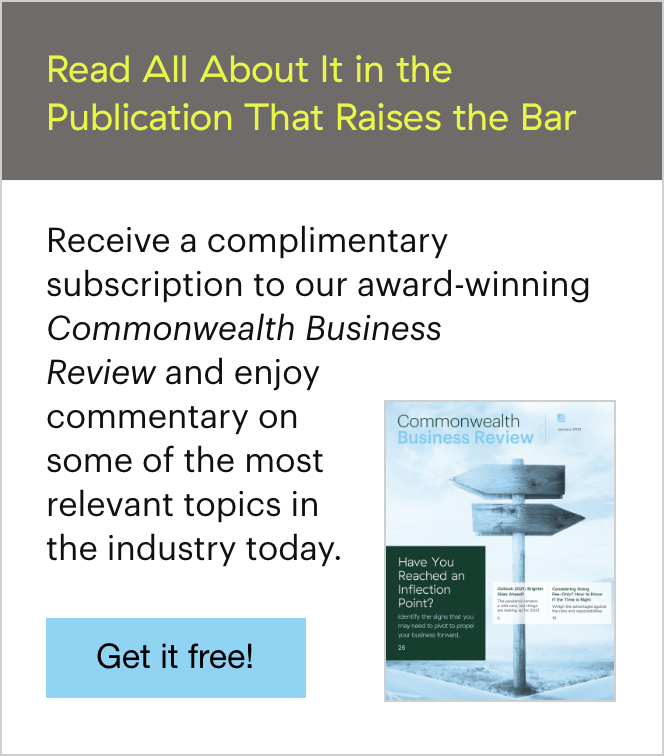 In fact, many institutional mutual funds available on fee-based platforms, like Commonwealth’s Preferred Portfolio Services® (PPS), have expense ratios comparable with ETFs. ETFs, however, have the added advantage of shielding the average long-term investor from the actions of others. For example, investors don’t have to absorb commissions and trading spreads when investing in ETFs. Nor are they forced to receive capital gains distributions. The investor with a long time horizon can potentially benefit more from the results of compounding in lower-cost funds. Most advisors likely subscribe to the benefits of asset allocation mentioned in Module I, but fewer adhere to a strict rebalancing policy. If you’re not using a turnkey, auto-rebalancing solution, the thought of rebalancing your book might seem like an operational nightmare. You might also be put off by the associated cost. Keep in mind, though, that as a portfolio drifts from its initial allocation, and no rebalancing is done, volatility increases. This “let it ride!” approach can be advantageous during market expansion, but it can be deleterious during a downturn. The ultimate value of rebalancing is manifested in the ability to minimize risk and ensure that a portfolio remains aligned with its original objectives. It is no coincidence that this module has the potentially highest value-add and is also the hardest to implement. After all, advisors have been trained in the concepts of compounding, interest rates, and other quantitative measures but not necessarily in the emotional hand-holding that a positive investing experience often requires. Do you allot enough time toward behavioral coaching? Does your client discovery process ask clients about their emotions regarding money? Behavioral distractions, like market timing and performance chasing, are common reasons why financial plans fail, so building an open and trusting relationship is crucial. 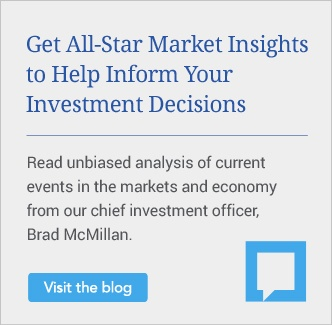 Remember, although market performance is beyond your control, you can exert a great deal of influence over clients by talking them out of poor investment decisions—if the rapport is there. Asset location, not to be confused with asset allocation, takes maximum advantage of the yield spread between taxable and municipal bonds in an attempt to generate an increased and more certain return premium. The beauty of this module is in the simplicity of recognizing in which account (qualified or nonqualified) to purchase suitable holdings for your client. It may not be easy to relocate assets from established portfolios, but for clients in the accumulation stage, this is a great opportunity to strengthen the client-advisor bond by explicitly describing the significance of this approach and its long-term impact. Like we saw in the last module, the value-add here is the minimization of taxes. After taking any required minimum distributions, delaying the receipt of income from qualified accounts maximizes long-term portfolio growth. But unlike we saw in the last module, this strategy can be implemented at any time since there is no need to reposition assets. If you have clients in the distribution stage who aren’t employing this approach, here’s a great opportunity to reach out to them. Although it may not generate any immediate, direct business, the goodwill generated can go a long way toward bolstering your client relationships. Retirees have historically been able to live off of the income stream from their portfolios. With yields at historic lows, however, this “income-only” approach is no longer viable. Instead, a “total-return” approach, which incorporates both income and capital appreciation, brings with it the advantages of less risk, better tax efficiency, and a potentially longer portfolio life span. Whether or not you accept Vanguard’s methods to quantify your value-add, adopting some or all of these seven best practices will help you better demonstrate the variety of services you perform for clients to help them effectively pursue their financial goals. Although you may not always achieve “about 3 percent” in additional return for your clients each year, there’s no denying that moving your value proposition away from investment performance and toward a more comprehensive wealth management focus will be good for both your clients and your practice. Do you implement any of these strategies—or any others—to add alpha for clients? Share by commenting below!